The Ann Arbor planning commission recommended all three items for approval at its meeting on June 17, 2014. 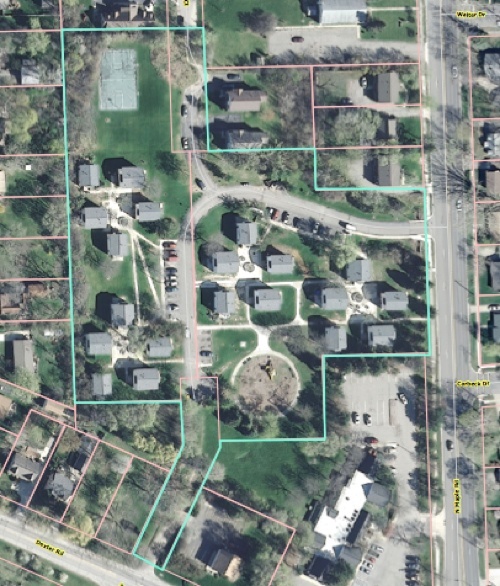 The council gave initial approval of the rezoning at its July 7, 2014 meeting. The units in the eight-building, 42-unit apartment complex are proposed to have a total of 138 bedrooms. The units range in size from one bedroom to five bedrooms. The project will include a playground, community building and 73 parking spaces. According to a staff memo, the buildings will be located along a T-shaped driveway that connects to North Maple Road and Dexter Avenue. The drive extends northward toward Vine Court but does not connect with that street. There would be a new connection to Dexter Avenue through the remaining, undeveloped length of Seybold Drive. The project also requires the city to vacate a portion of the right-of-way for Seybold Drive. The surrounding land is owned by the housing commission, the land will become part of the housing commission property. In a separate vote, the planning commission also recommended approving that request.